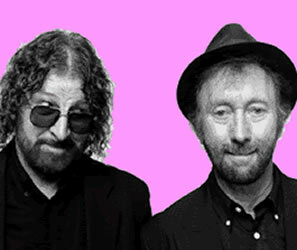 When Chas and Dave got back together again in 2011 for what was billed as a “Final Farewell Tour”, thousands of people were thrilled and excited by this news. But not me. Now they’ve announced that their final ever show is to be at the 100 Club on Sunday May 15th, 2011. For six years I worked with Chas and Dave and I organised the vast majority of their London shows, including their annual Christmas Beano. When I first came across them in a professional capacity (I was promoting Friday nights at London’s 300-capacity 100 Club), Chas & Dave were playing to half-full Sunday night houses there. To me Chas & Dave were (and still are) an important part of British rock music and as vital to London and its music as The Kinks, Ian Dury, Squeeze and The Small Faces. An instruction to new writers is “write about what you know” and that’s exactly what set Chas & Dave apart from the herd. At a time when most British popsters were singing about Route 66 and Thunderbird Cars in a mid-Atlantic drawl, Chas & Dave were lauding “Edmonton Green”, Friday night in the local and “London Girls” in their real (London) voices. When the people organising Sunday nights at the 100 Club moved on, club owner, Jeff Horton suggested I put Chas & Dave on for one of my regular Friday nights. I tracked down their then agent, an Essex woman called Julie, and booked Chas and Dave for a fairly modest flat fee and set about spreading the word. I worked hard on the event and spent a lot of time and money organising flyers, posters and emails. A couple of years previously, one of their other admirers, Pete Doherty had included them in the London shows for the Libertine, which helped introduce Chas n Dave to a younger audience. It was that market I was aiming at, rather than the middle-aged Cockneys who remembered them from their 1979-1980s heyday. That first night went well (very nearly sold out) and we put in another. Pretty soon Chas & Dave were selling out shows at the 100 Club every time I put them on and, more importantly, we were getting on well. I got to know Dave, Chas and drummer Mick Burt, as well as their loyal and hard-working wives. Pretty soon I was putting on most of their London shows and working directly with Chas and Dave to help boost their image. They’d appeared at a punk festival in Blackpool in 2004 and Chas and/ or Dave had mentioned how they’d really like to play at the Glastonbury Festival. I said, leave it to me, and I called an old friend of mine, Paul Charles, who was responsible for booking acts for the Acoustic Stage at Glastonbury. Although he was almost completely booked up, he liked the idea and managed to squeeze them in on the Saturday afternoon at 2.30pm. I didn’t get any money for this (as far as I know, their new agent, Barry Collings pocketed the commission) and there wasn’t even a spare ticket available for me to go and watch them. But, as has become well known, that one hour set changed their lives and revitalised Chas and Dave’s career. After that, Chas and Dave became hot property. That was when we thought up the idea of the Christmas Beano. Chas and Dave still wanted to play at the 100 Club but now we’d try a big annual show at a much larger venue. The first one was at the Shepherd’s Bush Empire and we had 1,200 in to see Chas and Dave and a very good tribute band, Rolling Stoned. Their new agent, Barry Collings found it hard to say no to people offering money and so every year we did a Christmas Beano there’d always be another event competing with it. “Oh, is Harlesden in London?” Barry, the Southend agent would say. (I can’t remember exactly where they all were, but they were places like Walthamstow, Cricklewood, Ealing, Wimbledon and Crouch End).